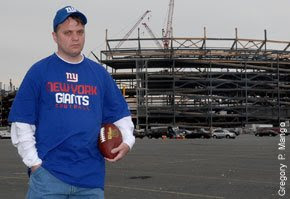 As you know, this blog has a serious, no-nonsense Giants fan for a brother-in-law. And if you've read the excellent open letter he and his wife wrote to the Maras a while back, they are not so much in love with the Giants seat licensing plan. ($20,000 for the right to spend another jillion on the actual tickets) My posting of the letter is a small way to join their raging crusade against this ticket stick-up the Giants are committing. Well, to join these Righteous Raging Giant fans comes the New York Post. That's right, the world's most dangerous newspaper has printed a story on my brother-in-law and his crusade. And for your reading enjoyment, here it is. And if you like what you hear, join the fight against this seat licensing fee rip-off. "Season tickets are luxury, if you can't afford them, don't buy them"
"People are taking out mortgages to buy Giants tickets? Are you kidding me? There are people in America right now who can't afford their homes and this guy is crying about football?" "I love how upset sports fans get when the team they like treats them like a customer and not some life-long friend"
It's true, it's just a business, nothing personal as they say in the mob. Tell you what, if you want to do something about it, get a strike going. Pool your friends and tell the team you are not buying any more tickets or merchandise. Better yet, stop wasting your valuable time, money and emotion on a corporate entity that doesn't care if you are dead or alive as long as you are shelling out your hard earned cash on their crap.